Recently I wrote about Tile'M All and Jelly Blocks. 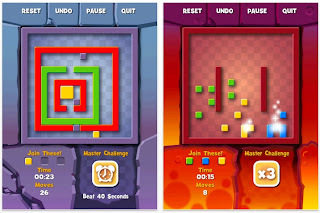 Both are rock solid challenging puzzle apps where the object is to get all the colored shapes together. I've been told that the original concept was known as Denki Blocks. It's not new. And it's a bit expensive at $4.99. But I think it's well worth it. Most of the puzzles have 2 objectives: first to get all the colored shapes together. The second, more challenging goal is to make each final shape identical. There are over 100 levels. I have not solved them all. I've done about 70 of them. There is a 'free' version. So give that a test spin. I'm pretty sure you will then get the full version.